29.08.2012: The Curse of Berlin: Africa after the Cold War, Berlin - INISA e.V. The Curse of Berlin refers to the Conference of Berlin in 1884 – 1885 at which the rules were effectively set by European states for the partition of Africa. Dr Adebajo argues in his book that historical and structural events continue to affect and shape Africa’s contemporary international relations. It adopts a historical approach, even though its main focus is on contemporary African politics. Analysing Africa’s quest for security, for leadership, and for unity the book offers “an intellectually and morally courageous analysis of Africa’s place in the world, a tracing of its traumatic history, not to bemoan it, but to understand where Africa has come from, to appreciate where it is at present, and to shed light on where it is headed” (Professor Francis M. Deng, UN Special Adviser on the Prevention of Genocide). Adekeye Adebajo has been Executive Director of the Centre for Conflict Resolution (CCR), Cape Town, South Africa since 2003. He served as Director of the Africa Programme of the New Yorkbased International Peace Academy. During the same period, Dr. Adebajo was an Adjunct Professor at Columbia University’s School of International and Public Affairs (SIPA) in New York. Dr. Adebajo served on UN missions in South Africa, Iraq and Western Sahara. He is the author of Building Peace in West Africa; Liberia’s Civil War; The Curse of Berlin; and UN Peacekeeping in Africa. He obtained his doctorate from Oxford University in England, where he studied as a Rhodes Scholar. Herta Däubler-Gmelin, by profession a lawyer (constitutional, international, European law), was Federal Minister of Justice from 1998 to 2002 and a member of the German Bundestag from 1972 to 2009. Mrs Däubler-Gmelin is teaching as an honorary professor at FU Berlin, Tongji University Shanghai, RWTH Aachen. Her main focus is on constitutional and international law, human rights and humanitarian law. She headed the German - SADEC Parl. 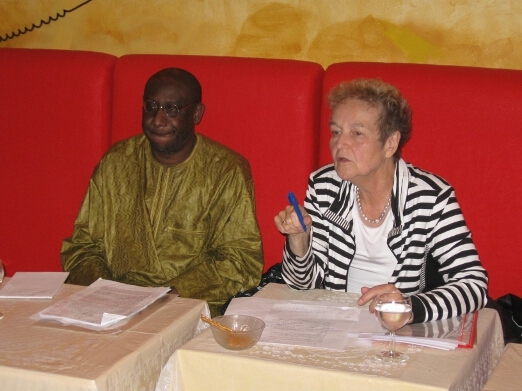 Group and the Africa Working Group of the SPD and chaired the Committee for Human Rights and Humanitarian Aid of the German Bundestag and of COE`s Parliamentary Assembly. Now she is a consultant in constitutional and human rights matters in various countries, e.g. Vietnam, Tunisia, Turkey and to the EU–Commission.